Phoebe Handsjuk — May 9, 1986 - December 2, 2010. What happened? May 9, 1986 - December 2, 2010. What happened? The Inquest has now adjourned and will resume in October. We’ve had some questions regarding the coverage of the inquest. Given the volume and complexity of evidence heard during the last 4 weeks, we thought it best to leave coverage of the inquest to the media. We’ve been updating the press page as new coverage has come to our attention. If we’ve missed anything, please feel free to point it out in the comments section or on the facebook page and we’ll update the list on the site. It has been an incredibly taxing time for the family and we’d like to extend a HUGE thank you to our friends, family and the community for all your incredible support over the last two and half years. We would not have got this far without your help. Today marked the end of the 3rd week of the Inquest. There is evidence to be heard next week and then in October, after which, upon consideration of submissions, the Coroner will hand down his finding. The Inquest has officially started today and is scheduled to run for three weeks, from the 5th until the 23rd of August, at the Coroners Court of Victoria. The court typically convenes from 10am until 4pm, with a break from 1pm until 2.30pm. The court will not convene this Wednesday or Thursday (the 7th and 8th of August). The Coroners Court of Victoria is located at Level 11, 222 Exhibition Street, Melbourne, Victoria. 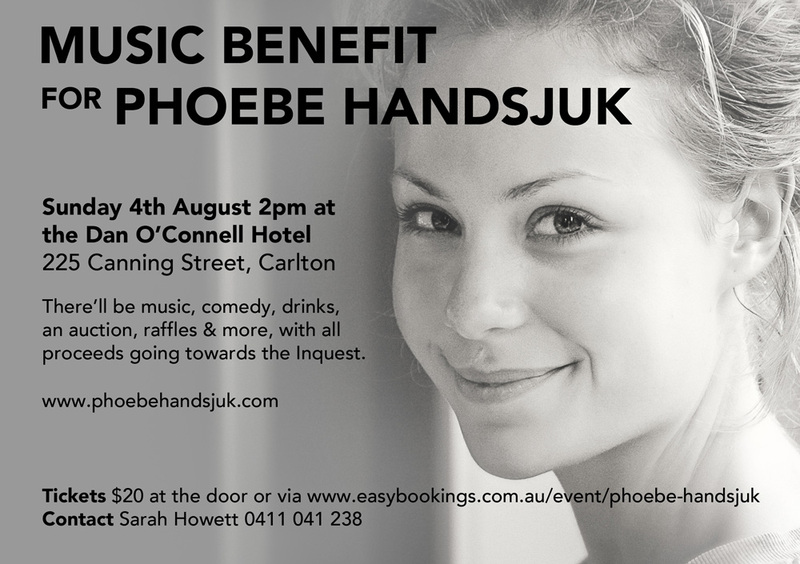 Music Benefit for Phoebe Handsjuk. August 4th at the Dan O’Connell Hotel in Carlton, from 2PM. A benefit will be held on Sunday the 4th of August at the Dan O’Connell Hotel in Carlton from 2pm. There will be live music, comedy, an auction, raffles and more. It will be a great afternoon and we’d love to see you there. All proceeds will go towards the legal costs for inquest. A fundraiser will be held on Saturday the 20th of July at 4PM at the Mallacoota Golf and Country Club. There will be live music, delicious food and an auction. All proceeds will go towards the legal costs for the coronial inquest to be held from the 5th of August 2013. With its serene lake, rugged beaches and natural beauty, Mallacoota was a very special place for Phoebe. It is her resting place and will forever be the setting of many fond memories. We have set up a campaign to help us raise the money to cover the cost of having legal representation at the inquest. A donation as small as $5.00 will help. You can find more details on the Support the Inquest page. We are enormously grateful for all the love and support we have received from everyone since we lost Phoebe in December 2010. Sadly, there are still many questions surrounding her death. We hope the inquest will allow us to find the answers. A Directions hearing was held in the Coroners Court on the 1st of May 2013. A witness list was established and a date was confirmed for the Inquest. It will begin on the 5th of August 2013 and is predicted to run for three weeks. Twenty seven witnesses will be called. The purpose of the inquest is to establish the findings required by section 67 of the Act. Which include the cause of death and the circumstances in which the death occurred. *note: A coroner my hold an inquest into any death they are investigating pursuant to section 52(1) of the Coroners Act 2008 (the Act). This is referred to as a discretionary inquest. Thae Act also outlines circumstances where an inquest must be conducted, such as where the coroner suspects the death was the result of homicide [section 52(2)(a)]. this is referred to as a mandatory inquest. We have been advised that a directions hearing will be convened on the 1st of May and that time has been set aside in August for the inquest. On behalf of our family, I would like to take this opportunity, once again, to thank you all for your overwhelming support for us, in our search for the truth of what happened to Phoebe. This is a further step towards unravelling the mystery of her death. We will keep you updated on any further information. Help uncover the truth of what really happened to Phoebe. Support the inquest. On the evening of the 2nd of December 2010, 24 year old Phoebe Handsjuk was found dead on the floor of the refuse compactor room at the bottom of ‘Balencea’, a luxury high rise apartment building, located on St Kilda Road Melbourne. It was discovered that she had fallen feet first from the 12th floor refuse room, down the waste disposal shaft to the compactor below. The Toxicology report revealed Phoebe to have a blood alcohol reading of 0.16% and high levels of prescription drugs. There have been no known reported incidents of a cause of death such as this, in the history of Australia. On the 7th of December, Homicide detectives said that no second party was involved in Phoebe’s death; she had entered the chute, feet first, voluntarily. The police brief was passed to Detective Senior Constable Brendan Payne of the South Melbourne Criminal Investigation Unit to be completed for the Coroner. Phoebe’s Grandfather, retired Detective Sergeant Lorne Campbell had suspicions regarding the circumstances surrounding her death from the outset. He began to ask questions of the police and to make his own enquiries. Senior Detective Brendan Payne and Lorne Campbell have worked for over two years, in an attempt to unravel the unexplained mysteries surrounding her violent and tragic death. We, the family, have requested that there be an open Coronial Inquest into Phoebe’s death, where witnesses can be cross examined, in the hope of finding answers to the many questions still remaining. The Brief is now with Coroner Peter White of the Coroners Court of Victoria. We await his decision whether to hold an Inquest. You may view the history of media coverage on the Press page. Commentary by Lorne Campbell on the findings of Coroner White, delivered on 10th December, 2014 following the inquest into the death of Phoebe Handsjuk.